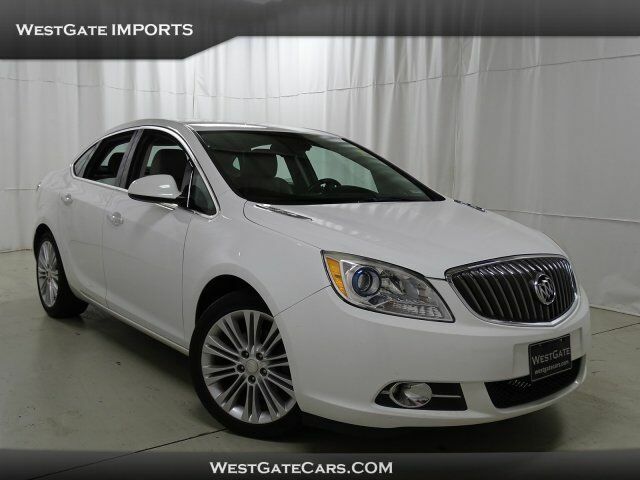 This Buick Verano has a dependable Gas/Ethanol 4-cyl 2.4L/145 engine powering this Automatic transmission. WHEELS, 18" X 8" (45.7 CM X 20.3 CM) SPLIT MULTI-SPOKE ALLOY with Silver finish (STD), TRANSMISSION, 6-SPEED AUTOMATIC, ELECTRONICALLY CONTROLLED WITH OVERDRIVE includes Driver Shift Control (STD), SUMMIT WHITE. 9 Carfax Service Records. SEATS, FRONT BUCKET WITH SEATBACK MAP POCKETS, MEDIUM TITANIUM, PREMIUM RIBBON FABRIC INSERTS WITH LEATHERETTE BOLSTERS, LPO, ALL-WEATHER FLOOR MATS, FRONT AND REAR, LICENSE PLATE BRACKET, FRONT, ENGINE, ECOTEC 2.4L DOHC 4-CYLINDER SIDI (SPARK IGNITION DIRECT INJECTION) with VVT (Variable Valve Timing) and E85 capability (180 hp [134.28 kW] @ 6700 rpm, 171 lb-ft of torque [230.85 N-m] @ 4900 rpm) (STD), ENGINE BLOCK HEATER, AUDIO SYSTEM, AM/FM/SIRIUSXM STEREO WITH MP3 CD PLAYER, USB AND AUX PORT IntelliLink AM/FM/SiriusXM stereo with 7" color LED touch screen display and MP3 CD player, USB and AUX port, MP3/WMA playback, iPod support and upgradeable software, includes phonebook access, voice recognition for audio, phone, phonebook and music selection, Pandora and Stitcher Smartphone compatible, SiriusXM weather and data services, and software Bluetooth and Smartphone interface upgradeable (STD), 1SG PREFERRED EQUIPMENT GROUP Includes Standard Equipment, Wipers, front intermittent, variable, Windshield, solar absorbing, Windshield style, acoustic laminated glass, Windows, power, rear with Express-Down, Window, power with front passenger Express-Down, Window, power with driver Express-Up/Down, Wheels, 18" X 8" (45.7 cm x 20.3 cm) split multi-spoke alloy with Silver finish (Includes (RJ0) P235/45R18 all-season blackwall tires.). Stop by Westgate Chrysler Jeep Dodge Ram located at 6421 Old Westgate Rd, Raleigh, NC 27617 for a quick visit and a great vehicle!